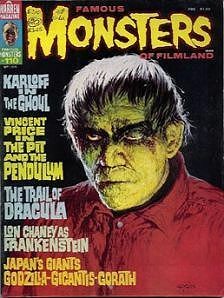 September 1974 issue of FM with cover featuring Karloff in "The Ghoul". There is some writing in ink inside the "M" on the cover, and again on the contents page. Otherwise, near-mint. The Ghoul was a film once thought to be lost, but a copy of it turned up in Europe many years ago, so now it's found. The film is pretty dated, but still has some nice moments. Website design and hosting by Sohodojo Business Services. Item 110 of 466 items displayed in viewer. 0 items in cart.